Are you familiar with the basics and the different applications of the 555 timer IC. If not, we recommend you 3 books that provide a very good understanding of the IC and its applications. You can check out the reviews and buy the book from our online store:-Â 3 Great Books to Learn 555 Timer Circuits and Projects. A simple but very reliable and effective water level controller circuit diagram is shown here. The circuit uses 6 transistors, 1 NE555 timer IC, a relay and few passive components. The circuit is completely automatic which starts the pump motor when the water level in the over head tank goes below a preset level and switches OFF the pump when the water level in the over head tank goes above the full level. Probe D is positioned at the bottom level of the tank while probes A, B and C are placed at full, half and medium levels of the tank respectively. The level sensing part of the circuit is built around transistors Q1, Q2 and Q3. When water level is below the quarter level probes A, B and C are open and the transistor Q1, Q2 and Q3 remains OFF. When the water level rises and touches the probes the corresponding transistors gets biased and switches ON. Resistors R1, R2, R3 limit the bases current of corresponding transistors while resistors R4, R5, R6 limit their collector current. LEDs D1, D2 and D3 provide a visible indication of the current water level. When the water level goes below medium, transistor Q2 gets switches OFF and its collector goes positive. Collector of Q2 is connected to the base of transistor Q6 and as result transistor Q6 gets switched ON. Transistor Q5 will be also ON because its base in connected to the collector of Q4 which is presently OFF. As a result when the water level goes below medium relay K1 gets energized and the pump is driven. The relay is wired in the latching mode so that even if the water level goes above medium level the pump remains ON so that the tank gets completely filled. For wiring the relay in latching mode one setÂ of N/O contacts is used. When relay is activated these contacts close which forms a short across collector and emitter of Q6. This makes the state of Q6 irrelevant to the operation of the relay and the relay remains ON as long as the transistor Q5 is ON. The only way to make the relay OFF is by switching OFF Q5 and it is done automatically when the water level reaches the full level. Collector of transistor Q1 is connected to the trigger pin (pin2) of IC1. When the water level reaches full level the transistor Q1 gets switched ON. As a result its collector goes to ground level which triggers the IC1 which is wired as a monostable. The output of IC1 goes high for about 1S. This makes the transistor Q4 ON for the same time and transistor Q5 whose base is connected to the collector of Q4 is switched OFF cutting the supply to the relay. This makes the motor OFF and it remains OFF until the water level again goes below the medium level. Resistor R8 is a pull up resistor for the trigger pin of the NE555. Capacitor C3 couples the collector of Q1 to the trigger pin of NE555 and facilitates edge triggering whenever the transistor Q1 goes ON. A monostable circuit can be made edge triggered by connecting the trigger signal to the trigger input pin through a capacitor. The capacitor blocks DC and passes sudden changes. The circuit used here is termed as negative edge triggered because the monostable is triggered when ever the trigger input signal falls. R10 and R12 limits the collector current of Q4 and Q5 respectively while R9 and R11 limits their base current. R13 limits the base current of Q6 while D4 is a freewheeling diode which protects the switching transistors from voltage transients. 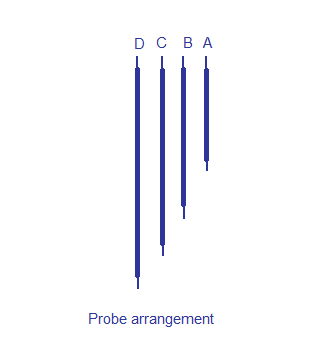 The probes can be arranged as shown in the diagram above. Insulated Aluminium wires can be used as the probes. The probes can be binded on a plastic rod and should be erected vertically inside the tank. The length of the probes wires and the supporting plastic rod must be chosen according to the depth of the tank. Since DC is used in the level sensing section electrolysis will occur in the probes and so the probes require small maintenances in 1 or 2 month intervals. Using AC in the sensing section will completely eliminates the chance of electrolysis and I am presently working on such a circuit. You can expect it soon. Use 12V DC for powering the water level controller circuit. The relay I used was a 5V/220 ohm relay and thatâ€™s why the current limits resistor R12 was added in the circuit. If you use a 12V relay then the R12 can be shorted. Do not use a relay that consumes 500mA. Maximum collector current PN2222 can handle is 600mA. Use insulated single strand aluminium wires for probe and they can be arranged in the tank as per the probe arrangement diagram. Use a holder for mounting NE555. K1 must be a double pole relay. The load current, voltage ratings of the relay must be selected according to the ratings of the pump motor. The type number of the transistors used here are not very critical and you can do suitable replacements if any type number is not available. Most of the components required for this project can be found inside your scrap box. A classic 12V regulated DC supply based on 7812 is shown above. A power ON indicator LED is also added in the circuit.Resistor R13 limits the LED current. A small aluminium heatsink can be fitted to the 7812 for better saftey.Small Al heatsinks for TO-220 package are readily available in the market. Itâ€™s a very nice project. Thank you very much for sharing this project. Previously I have done some project using the Arduino. Now I am doing some project using Microcontroller. I have wished to do that project very soon. This circuit may not work. As the water rises, the first transistor may be turned on very slowly and the collector voltage will fall very slowly. The 2u2 will gradually charge via the 100k pull-up resistor and the voltage on pin 2 will never fall to 4v. hi can this circuit be used in reverse ? Pump turns when it is full and stop a certain water level is reached? Hi. I tried to simulate this circuit but I’m not getting any voltage at the output of the timer. Please what could be the problem? I find this circuit very interesting , however I would like to have some modifications to suit my requirement. Can you please help me do that? I would like to have low level pump starts ,high level pump shuts off and a sump level protector when the level is low the pump turns off. I also want to use float level switches instead of the probe can you please alter the circuit and mail me so that I can creat this project the way I requested you. overhead water tank level motor cut off /on and water filling sensing , ground level sump tank water level control sensing for motor cut off/ on. controller price quotation required with erection & commissioning charges. Sir How to connect power supply ACandDC and motor connection please notify me. I am complete this circuit and tested in baiket water it is working and I install to overhead tank it is not working properly some problems come when water goes below probe b relay not on and d2 led not fully off it is dem showing after half and one hour relay getting on what can I do please help me sir. Whatshould we connect at P and N point? what is connected at P and N in the circuit? P stands for Phase and N stands for Neutral. Its a point probably AC for powering your water pump. What is connected at P and N? Your circuit helps me alot in my field of learning and open my mind too, please i can guys sent me more circuit so it will back me.Thank you very much. that is good circuit but the stainless for the probes is good becoues of chemacals. i want to know which relay should be used in the circuit 6 pin or 8 pin?help plz if anyone could ..
sir i’m in confusion regarding the dp relay which is of 6 pin but in market only 5 pin relay is available so pls help me ………..
How it will work when dry run? Check the probes for correct level. Disconnect probe B and see whether D2 is swishing off. Are you using specified 5 volt 220 ohms relay or something else. No other relays will work in the place. It is a proven circuit it should work check your wiring thoroughly. Use stainless steel rods, do not use copper or aluminum. I have built the circuit, and when I energize it, two of the LED lights come on and the other LED light stays off. When I energize the circuit, the relay chatters and when I fill the bin with water, the other LED light comes on, but the pump never goes off and the relay continues to chatter. Any ideas? If you are using 5 volt 220 ohms relay this should not happen. Please check whether the NO (normally open contact when relay is off) is connected for self latching of relay. (bypassing Q6). If these checks are OK check for the correctness of probe connections. Lower most probe should get connected to +12 volts DC. When water level is more than quarter tank Q3 will be on and D3 LED will be lit. When water goes above half tank level Q2 will be on and LED D2 will be lit. Once tank water reaches full level Q1 will be on and LED D1 will be lit and will switch of the pump motor. When water goes below half tank level Q2 LED will go off and pump motor will start. Where do I connect the pump to the relay? Yes through ‘NO’ contact connect pump motor live connection to power live and connect neutral direct to the pump motor. Can you please provide me with a component list and pictures showing this regards. connect negative at ground line………. seetharaman sir can u please tell me what is the use of 1N4007 diode in the circuit??? what is latching mode of the relay??? how to wire the relay in latching mode???? 1N4007 in parallel with the relay to protect the diving element from the back EMF of the relay during switch off. called free wheeling diode. Latching of the relay is sullying the power through its own normally open contact for energising the relay. When relay coil gets an on pulse from the driving element it will switch on and continue to be on through it own NO contact even if the driving element switches off. This is called latching of the relay. to switch off the supply to v\be removed for the next cycle of operation. I tried the circuit, i have second and third led always growing slighty and motor does not run? Can any one advise what could be the problemâ€¦. I am using 12 v relay and 12v dc motor. for 12 volt relay you have to modify this circuit totally. Try to use 5 volt relay to avoid the redesigning problem. This has contradicted your conclusion that you should only shot R12 when 12V relay is been applied. i tried this circuit but there is a problem in the output .please i want know basic error caused in the circuit. well can any one help me out??? i am using a single phase 18 watt motor.what should be the necessary rating and type of the relay??? Relay coil rating 5volts 200 ohms relay with 2pole changeover contact with AC rating of 250 volts 2amps contact rating relay. Is this relay in this circuit have two normally open contacts. yes you require 2 normally open contacts only if available can be used. as the standard relays available are with 2 change over contacts it is preferred. Can i use BC546 transistor instead of relay driver Q5 and Q6 PN2222? Use 2N2222 or S8050. NE555 & SE555 are one and the same you can use it. You have made an essencial & important circuit . In my case I just altered probe B & C .Because there is no use of probe C instead of glow LED, water level never goes down below C because if water level goes below B, Pump will automatically turn ON. so here Q3 always on to glow LED only and never turn OFF. If probe C placed above probe B, it will be perfect. I have placed probes in the following sequence A,C,B & D. A at the top (3/3), C at above half (2/3), B at below half (1/3) and D at bottom(0/3). Sir,can you help me upgrade the circuit. Because there is a time that the motor does not pump water.In that case,there is a possible that the motor be burned.I want to connect a circuit so that when there in no flowing water in the inlet pipe the motor will be automatically turn off after 5 seconds. @seetharaman can u design a circuit to control power in different rooms.ie,a circuit whereby a landlord can monitor how tenants consume the power and it can trip the supply when a preset amount of current is exceeded?.THINK ABOUT IT..
Who said this water controller doesn’t work?. I made it and its PERFECTO..works fine fine. it worked but if i want to do it for large scale what should i do for that ??? Hi you please use float swiches in place of probes, which requires cleaning every alternate months though it is SS. D project is ok but It as no conclusion part. sir do you have the full component/parts list? if you have plss send it to my email: markjoseph.catane@yahoo.com sir plss reply as soon as possible..thanks!! sir if you have any videos/pictures showing how it works can you also send it to my email:markjoseph.catane@yahoo.com thanks!! sir can you plss tell me all the parts one by one and the total of how may parts? sir plss send it to my email as soon as possible.. thanks in advance!! I need circuit diagram for water level controller which should be set in the underground tank which collects the water from the municipal. that is when the water level rises and attain a particular stage in the underground tank the motor should be switched on and the water if drain the motor should be set off that’s my requirements sir. Can you kindly explain the role of IC555 as it is a timer IC and i dont see any thing that is obviously using a timer related feature.. I am in process of constructing this circuit for my home. Here you have provided 3 level sensing probes where the middle one just shows that the level of water is above the height of the probe. Now my requirement is to have 5 probes where the first and last for switching OFF and switching ON the motor and remaining 3 LEDs just displays the level of water. Kindly suggest how this circuit can be improved to have that feature. My question is, does this sensor user AC or DC voltage to sense water in the tank? If it uses DC voltage will it cause the metal contacts to corrode in water? Hi singh dip relay contacts are for very low voltage switching current level. it must have got welded. please replace the relay with good quality double pole double throw (DPDT) (two change over contacts) 12volt DC relay with a contact rating of 250 volts 10amps AC. short R12. Sir if u don’t mind can u give your email address i wana know more about this becaus my last date for submit my project is 10 may 2013 plzz help me. can i use BC546 beside BC547 transistor…. Hi, sir sitharaman. I want to use this type of water level controller ckt for water well not in tank. Can i use same ckt in this case when water is ful then pump is on and when water is finished then pump is off. Plz reply me sir that is important. I tried this circuit, there is some error in this. When 12V (batteries) is given to the circuit, middle LED is always glow even other LEDs are glow. Relay is not working, I use 12V DP 8pin relay. Anything wrong in this ckt, help me anyone………. I tried this circuit. But relay is not working and second LED is always glow even other Led is glow. The 12V 8pin relay is not working I use 12V Dc (batteries) as supply. Is anything wrong in ckt. plz help me…..
sir what is the relay rating? Looks like good & cheapest circuit, I will make it for home. & Waiting for Water level controller using AC in Sensing section. Sir in led tourch using MAX660 the ic is not avalable in our area.can you prefer an suitable another ic.plz. Nice, I will try this…..
Hi i have chosen this to be my project work with small modifications of adding 7 seg. display to the transistor Q1& Q2 through transistors in series to them. can you help with this. i think this circuit is just fine for domestic water control systems . i want to know if there are any other likely faults, that may present itself in the process of building the circuit. i will be happy in you can help. I tried the circuit, i have second and third led always growing slighty and motor does not run? Can any one advise what could be the problem…. I am using 12 v relay and 12v dc motor. Thanks for the circuit. I used wanted to know if we can use same with 220V single phase motor pump. What will be the relay rating and what other changes required to be done in the circuit. Thanks. hi brother,relay is like a switch it can on and off all electric product.for i hp single phase motor relay should be minimum of 10amp.this circuit is made for 220v moter. neutral point will go direct to motor and phase will go through relay. Thanks Rohin for reply. In the notes, it is said that the PN2222 can handle 600mA max. How can i use replay of 10amp or more?? what type of pump controlled by this Circuit? please tell me about the pump ratting. is it possible to controlled a DC 12 V Water Pump. How was those resistor were selected? What current values were used to calculate them? hello sir, i have a problem to connect the relay switch.how to connect the relay switch on this circuit?can i connect 5 pin single phase relay on this circuit and how? thankyou. hi him kafle,you can use only 8 pin relay which call double poll relay.you are using single poll relay which have 5 pin.in this circuit a double poll relay is required.which have 8 pin.two pin are for coil 12vdc and rest pins are two com and two nc and two no point .you have to use only commen and no pin in this circuit.check with multimeter. one side is holding the relay and other side is for motor to switch on. Why aluminum wire? Do you know how much does this wires conduct to turn the transistor on? Can i please get pcb layou. Kindly sent it 2 ma id. Hi Ravi Both probes C and A to be interchanged. C is just to say the electronics is OK with D3 comming on (to indicate also the tank circuit is also healthy and level is minimum). Now read the above description you can understand better. Q2 will start the pumpamd Q1 will stop the pump. Q3 is only for indication nothing to do with automation. Please sir, I need you to send me a full detail of this project as soon as possible. It is very urgent. Thanks for your assistance sir. Hi there i think there is a problem with this circuit in terms of explanation how Q1 will be switched ON when the water reaches full level first of all where Q1 is a low level probe … in the explanation it is say ing that “the Collector of transistor Q1 is connected to the trigger pin (pin2) of IC1. When the water level reaches full level the transistor Q1 gets switched ON.” As far as i am seeing Q3 will be switched ON when the water reaches full level it will be biased which is probe C .
You can make your own probe by using 1/18 insulated aluminum cable with end exposed for 10 to 20mm to sense water. The probe arranging diagram indicates that clearly. & Waiting for Water level controller using AC in Sencing section. Can any one tell me how to make electrode Probe for water level sensing. or is there any electrode probes available in market? How can I use a LED or some other light on the place of DP relay (K1) to just check the circuit that its working or not. Also can I use a 12 V Battery directly as power supply? plz give me the pcb layout of that circuit. its urgent. sir plz send me full detailed project report on my mail id. it is very important and urjent. plz send as soon as possible. Hi Hari you can do, if you know how to activate the reed switch with raising or lowering of water level. Hi Tony DP relay is the requirement. The circuit cannot directly drive mains voltage driven AC motors. sir, kindly mail me the details of project… can i use sp relay in place of dp relay???? is it possible to short the relay and connect the motor directly to the circuit.. pls reply as soon as possible..
can you please send me the full project report of this ciruit..please its VERY urgent please. hi if it worked for you can u send me the pictures and arrangements on the bread board. i believe in this work that it works. Hi Sameer see my comment dated 19th September identify the probes and connect the probes as suggested. ,is it that the switch is applicable for this project in detecting water level?rply asap..please..
oreange -1no – connected to upper sensor in the sump, kindly me at the earliest , please. We tried simulations, and built. Pls,it is not working as it should. Do you have any improved method. hi wer to give the point P of the relay and N of pump plz reply……..
pls i need to know the polarity of the IC NE555 kindly send me the legs number pls i need a details that can make the pump off..
may i know how to create the circuit to send the signal through wireless?is there any need for us to add the antenna in the circuit? Hi Akila please read my comments dated september 19th. your circuits diagram are incorrect. brainless cow,because of you my water tank is empty and my Water pump exploded. Akila, Did you verify the connections? Please check your circuit arrangement as many people has assembled this correctly. Please complete for parts of articles to this circuit, I need you to email me a very interesting circuit design. can you give the full project report paper please help me! i want full informatatoin on this project.Because i am doing this project.pls. Fantastic project for science exhibition but not for real life as it is not corosion resistant. I am using it for my exhibition of class 9.
please let me know i want to put one bypass switch then what i have to do ..
hi sir! I just want to know that if I make a demo model using this circuit, and the height of lifting water is 8ft, then what is the specificationof the pump and relay??? Hi Ravi and Milton try this simple circuit. instead of using tank as a probe add one more proble be at the lower most level, touching almost bottom of the tank. i have gone through the procedures for the water level control and started constructing one. what is the theory underlying the action of this circuit? in my circuit the relay either gets closed or opened without automations. and the power suplly voltage drops drastically . what should i do? Have got the AC probes designed and working yet? You mentioned that, Using AC in the sensing section will completely eliminates the chance of electrolysis and I am presently working on such a circuit. You can expect it soon. this circuit is god but.what about dry run of motor? Yes I am also make one like this using float…it is semi automatic…..not fully automatic..It will switch off pump automatically need to make fully automatic How…????? and also need low voltage cutoff other wise it will damage water pump.. I am using a float on a vertical aluminium rod with two 4″ diameter aluminium discs (one for the upper limit and the lower one around one foot below).A mechanical switch with a lever (a kind of ‘limit switch’)is placed in between.When the water level goes down, the foat and discs go down. when the lower disc touches and pushes the switch lever,the switch turns ON and the pump starts.When the water level goes up, the float and the disc assembly goes up until the top disc pushes up the switch lever making the switch OFF and thereby the pump. I am using the mechanism for many years without any problem so far.Only thing is that we have to protect the switch from rain and hot sun. the ckt before 555 ic,is working only connect spdt 5 pin relay with it and motor the ckt works the i,c annd and rest of the ckt after it doesn’t works.